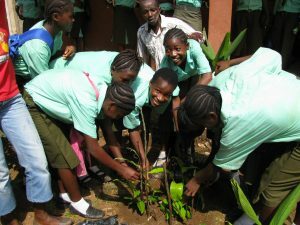 Tacugama Kids Environmental Education Programme (TKEEP) aims to increase sensitization and environmental awareness in primary schools, and give students the life skills to solve the environmental issues of the future. 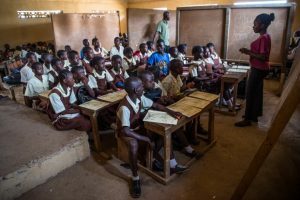 The programme has been successful in 10 schools around the Western Area Peninsula National Park (WAPNP) in Sierra Leone and 12 rural schools from Moyamba and Pujehun Districts. Currently the program involves over 800 students and distributes exciting and comprehensive environmental curricula, while also facilitating hands-on learning experiences for the students. We prioritize working with rural schools in smaller communities who have traditionally used the forest reserve to support their livelihoods. The main purpose of TKEEP is to create an understanding of the importance of the forest and generate interest for its protection. 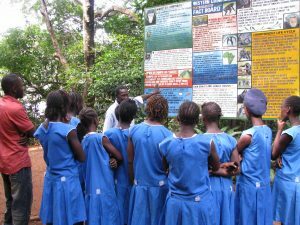 The forest plays a crucial role in ensuring clean water supply for Freetown and is coming under increasing threat from excessive human activity such as construction of roads and houses. TKEEP teaches in accordance to the national curriculum and includes an introduction to ecosystems and habitats, tropical rainforests, the water cycle, pollution, biodiversity and wildlife of the WAPNP, and discusses themes like conservation, logging, hunting and bushmeat trade. 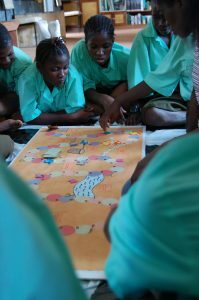 The lessons are taught using participatory methods, fun and games. Students are encouraged to go above and beyond the curriculum and have opportunities to win scholarships and prizes by displaying exemplary initiatives in conservations within their communities and around their schools. TKEEP aims to facilitate field trips to Tacugama Chimpanzee Sanctuary, and hosts conservation events and environmental days to increase appreciation for nature. The aim of our tours at Tacugama is to educate visitors about the importance of chimpanzees and the forests they inhabit, and spreading the message of environmental conservation. The rescued chimpanzees act as ambassadors for their wild counterparts, and seeing them firsthand helps people bridge the gap between humans and animals. Through informing visitors of the threats to chimps and other wildlife and the laws that protect them, we are actively engaging new audiences into the conservation movement. TKEEP students participate in a day-long field trip to visit the sanctuary and undertake more environmental learning activities. We want to teach children about the nature of chimpanzees, the laws that protect them, the threats they face and what we as communities can do about it. Many other schools in the region also frequent Tacugama for field trips. 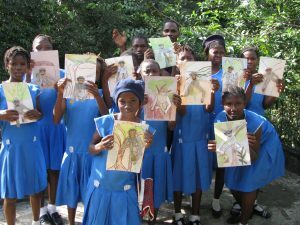 Our education team is always leading these tours to nurture the next generation of conservationists! We also work with local schoolchildren and communities on the peninsula in an effort to try to stem encroachment of towns and settlements into the forest. Early 2009 saw the start of the Tacugama Tree Nursery. The city is rapidly encroaching the countryside, with many houses being built but few utilizing the land to grow food. The nursery contains a few hundred seedlings, including mango and guava trees, and will provide some fruits for the sanctuary while generating local employment. Ultimately, we wish to demonstrate the potential for successful small-scale plantations thus encouraging local villagers to plant for themselves. We have now combined the Tacugama Tree Nursery program with the TKEEP program to teach children the importance of trees and how to plant their own trees. 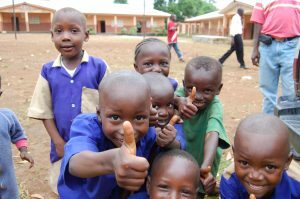 We distribute seedlings in each school and visit the schools to help them with the development of their trees. On Public Holidays, local communities are invited to Tacugama for a free sanctuary tour. This allows those who could not otherwise afford it, and those living in the immediate surrounding villages, to see chimpanzees firsthand and learn about protecting the forest they inhabit. The chimps are a great tool to engage these community members, many who have not seen one in their lives. The Tacugama staff, most of whom are members of these communities, are often leading the tours and educating their friends, family and neighbours about the human activities causing the loss of our forests, water supply and biodiversity, and how we can be better stewards of the nature around us.